Achieving your dream bathroom and creating an oasis in your own home isn’t as hard as you’d think. Just by adding glass shower doors, you instantly upgrade your bathroom. To take it to the next level, consider making these trendy shower doors the focal point in your design. If you want to upgrade to a completely modern look, frameless shower doors are the way to go. With no bulk, it’s a minimalist design that people love. These are really popular for glass shower door enclosures, but they also work with tub enclosures or partial enclosures. Not only is this design trendy, but it’s also versatile and timeless. A frameless shower door can elevate any shower design. Frosted shower doors and other designs are making a comeback. By adding a unique design, you can let your personality shine on your glass shower door. And all the while, you’re still prioritizing privacy. Frosted shower doors are functional but can also be trendy. A seamless design, a partial enclosure is efficient and looks sleek. These are also very functional. Your walk-in shower won’t have any ledge to step over. This will feel like you have a spa right in your home. With no moving parts, you won’t have to worry about water splashing around. These days everyone wants to save space. Corner showers are perfect for that. Or, if your shower isn’t already in the corner, you can consider using sliding glass doors or bifold doors. The way your glass shower door opens is just as important as the type of shower you choose. French doors are no longer just a great accent piece for your living room or dining room. Consider adding French doors as your shower door. These are really trendy right now but are also timeless and classy. We’ll let you in on a secret. This isn’t necessarily a trend, just something that should be on every glass shower door. You don’t want to have water splashing around when you go to reach for your towel that’s just out of reach. Instead, make sure you have a towel bar and handle combo installed. 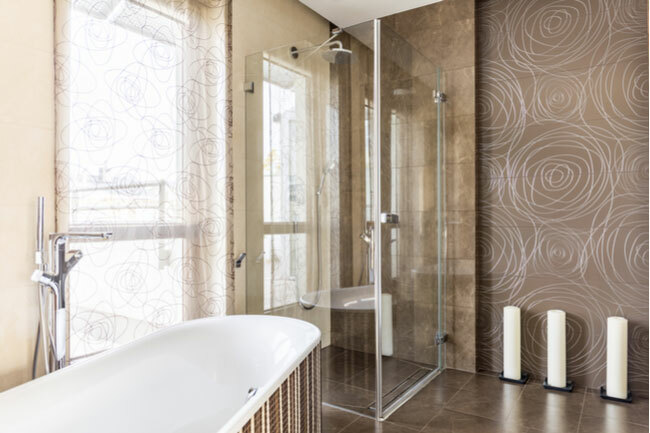 If you decide to go with a framed or semi framed shower, it’s becoming popular to use brass and gold accents on the hinges. People love mixing metals in their bathroom, too. Some people have copper fixtures, but gold frames. Those warm accents are making a comeback and we are loving it. It’s exciting to renovate your bathroom with all the latest trends. 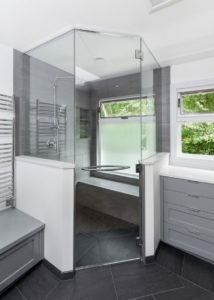 Our biggest tip for a shower reno is that as long as you are true to your personal style, the design will be timeless. Do you live in the Dallas, TX area? If so, we would love to help you find the right glass shower door for you! Call us at (214) 821-2886 to get started.